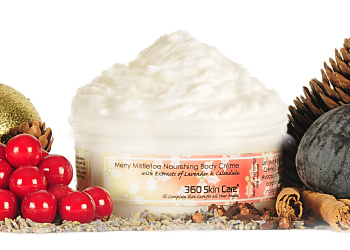 Let your skin pucker up for a kiss with 360 Skin Care’s Merry Mistletoe Nourishing Body Crème. Our decadent crème is a velvety concoction, rich in Organic Coconut Oil, Avocado Butter, Vitamin E, and Glycerin. Our rich crème incorporates five restorative botanical extracts to treat dry skin and promote cell regeneration. Use as a rich nourishing treatment for dry and troubled areas or to pamper your skin in luxury.